Need help sending a text via the website link? 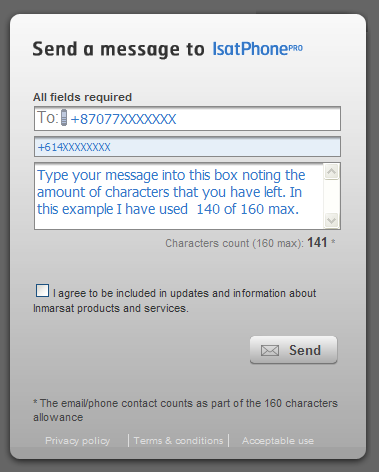 1.Enter the remaining satellite phone number. The +87077 will already be there for you. 2. Enter your phone number with the +61 for Australia and the second digit of your STD code. Omit the 0. 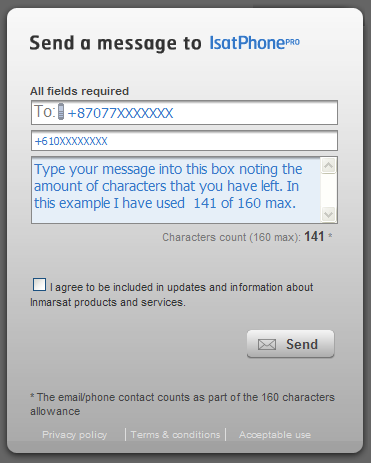 Then insert the rest of the number or alternativley if you prefer insert your email address into this field. Either will be sent to the phone with your message so that they can reply to you. 2. 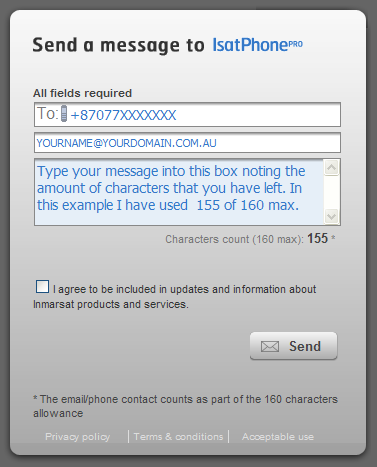 Enter your mobile phone number with the +61 for Australia and the leading 0 of your mobile omited as shown below or alternativley if you prefer insert your email address into this field. Either will be sent to the phone with your message so that they can reply to you.